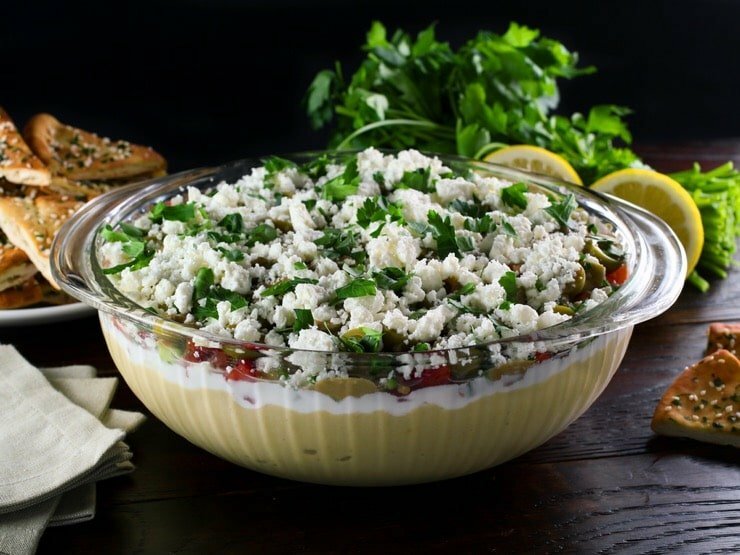 This Mediterranean 7 Layer Dip is a healthy twist on traditional Tex Mex seven layer dip. 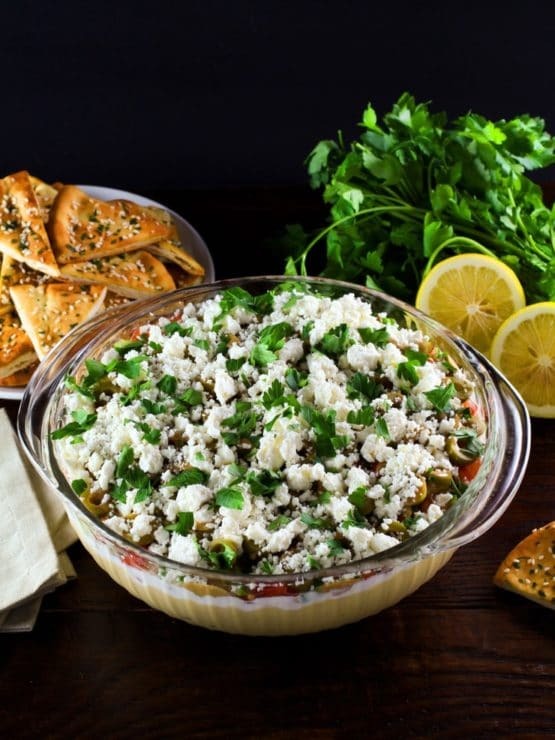 Layered hummus, Greek yogurt, Greek olives, feta cheese and more create a luscious dip to serve with pita chips or crudités. This recipe combines some of my very favorite mezze into seven layers of deliciousness. 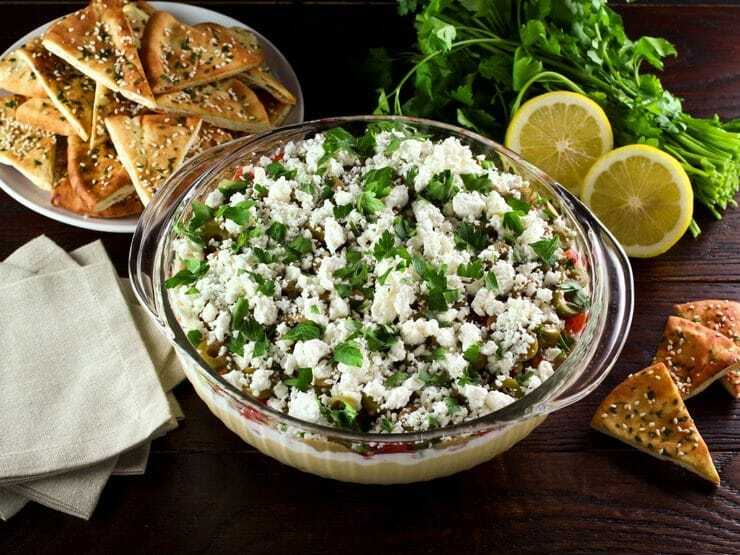 Hummus, labaneh or Greek yogurt, Israeli salad, Greek olives, and tahini sauce are topped off by crumbled feta and chopped fresh herbs. Use baked pita chips for dipping, or your favorite chips or fresh vegetables. The flavor is fresh, light and creamy. Make sure you use a good quality hummus. I recommend making your own, or at the very least visiting your local falafel joint to purchase some creamy, quality hummus. The store bought kind doesn’t usually cut it in terms of flavor. Of course if you have a favorite brand feel free to use it. Labaneh can be purchased at pretty much any Middle Eastern market, or you can make your own. I don’t usually single out brands, but if you happen to come across Tnuva labaneh from Israel, buy a whole cart full because it’s the most delicious thing ever. 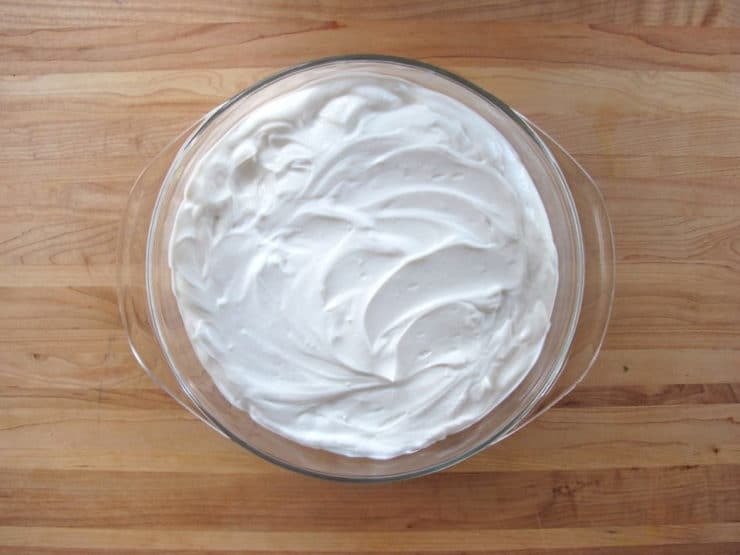 Greek yogurt makes a fine substitute; labaneh is just a bit creamier and more luscious. 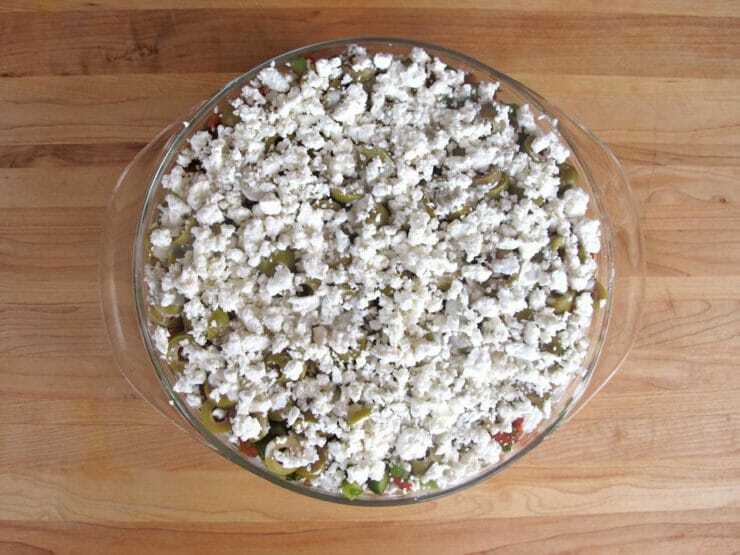 Additionally, I suggest you buy a block of feta cheese rather than the pre-crumbled variety. Generally the blocks taste creamier. This dip is gluten free on its own, so you can serve it with gluten free crackers or vegetables if you want to keep it gluten free. Take this to your New Years party and prepare to be the most popular person in the room. You’re welcome! 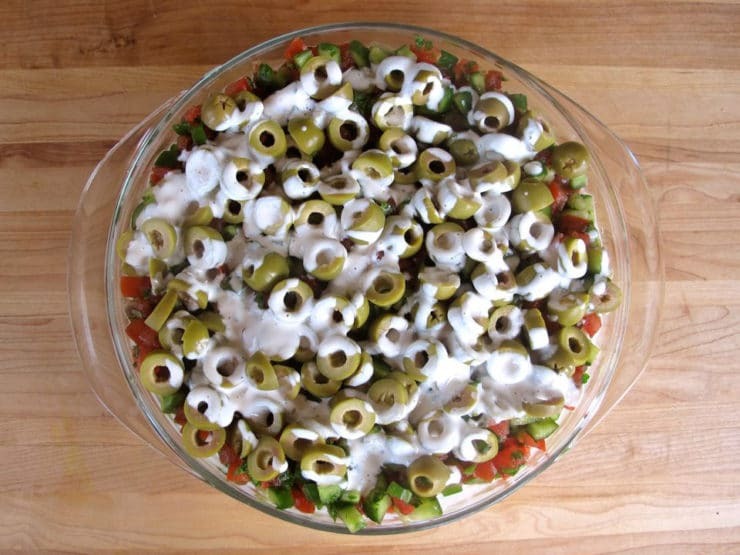 A healthy Mediterranean twist on seven layer dip with hummus, Greek yogurt, Greek olives, feta cheese and more. Serve with pita chips or crudités. 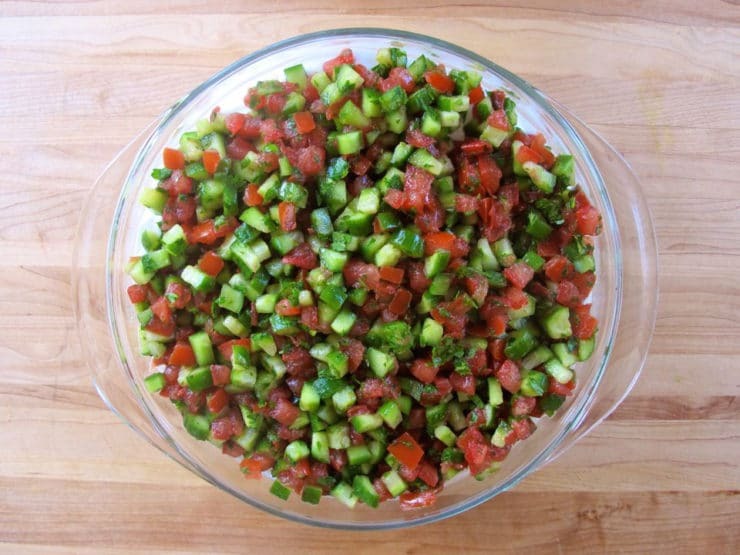 To make salad layer, combine diced cucumbers, tomatoes, parsley and salt in a small mixing bowl. Toss to combine, then transfer to a colander and allow the excess liquid to drain while you prepare the other ingredients (slicing, chopping, etc.). Let the salad stand and drain for at least 30 minutes. When the salad is fully drained, spread the 3 cups of hummus evenly into the bottom of your serving dish. 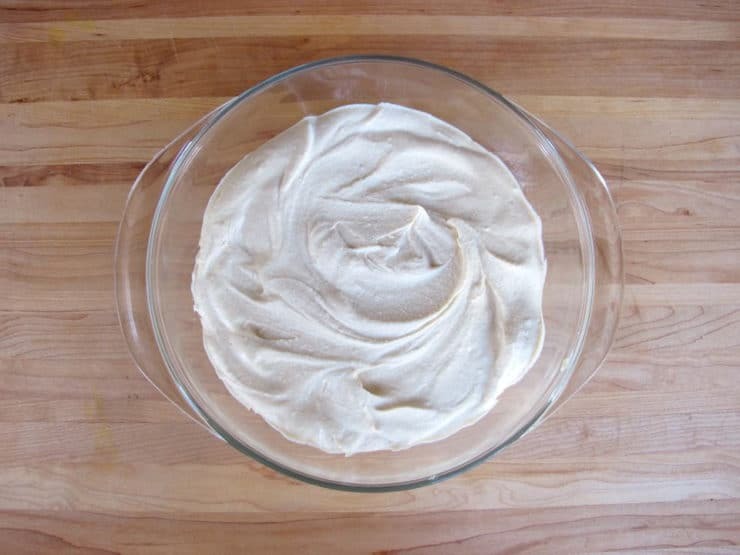 Next, evenly spread the labneh or Greek yogurt over the top of the hummus. 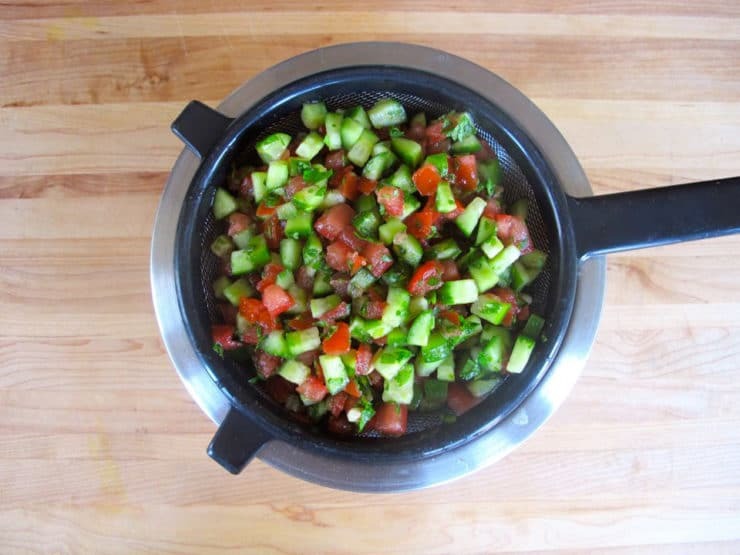 Stir the cucumber salad in the colander to make sure all liquid is thoroughly drained. Pile your drained salad mixture on top of the labneh/Greek yogurt. 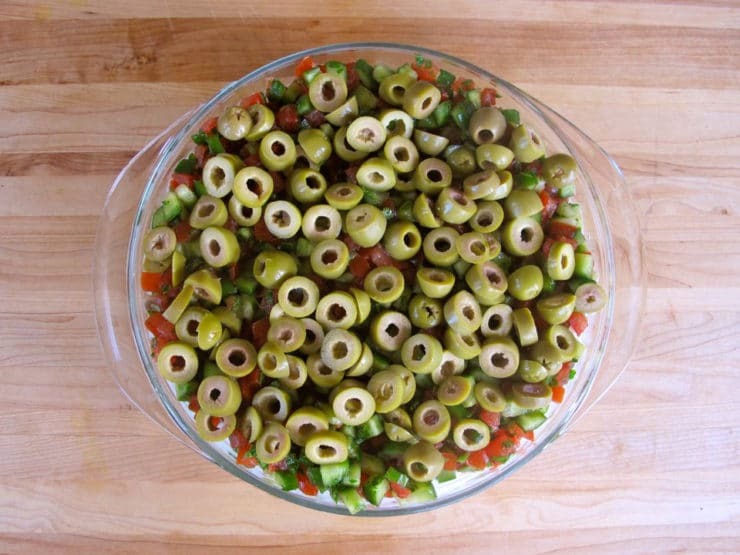 Then layer on the sliced olives. And finally, just before serving, sprinkle on your fresh lemon juice and chopped parsley or basil. This dip is great with pita chips! I made this tonight, minus the yogurt/labneh, and using vegan feta. I could have licked the bowl! This was amazing and hubby even liked it (he’s a huge carnivore). I made a low fodmap hummus and I made extra Israeli salad since, it’s my fave. I grabbed a picture and will post on IG. Thanks for so much yumminess! Wow! This is just such a winner on so many levels! (I substituted baba ghanouj for hummus, as sadly, I cannot digest legumes, therefore no hummus.) Everyone really enjoyed it at the gathering we took it to last night, served with crudites and gluten-free crackers. I changed around the order of the layers with the salad on the bottom and found the leftovers kept well overnight and had it for lunch today. Thank you for this and all your awesome posts, along with origins and history – always interesting and fun to read! Glad you enjoyed it Shari! I noticed the tahini drizzle in the photos seems pourable. The recipe for tahini sauce isn’t coming up. I’m hosting my book club in a few hours and am ready to put things together, however I need help with what to do with my tahini to make it drizzle-able! Please and thank you!! Here is the recipe: https://toriavey.com/toris-kitchen/tahini-sauce/ you can thin it out by blending in additional water. Tori you are so creative! I made this yesterday, everyone loved it! I built my layers on rectangular serving plates and made two arrangements. So delicious. Thank you so much for sharing this wonderful recipe. Glad you enjoyed it Theresa! I made this last night and it tasted very good however I would put it on a platter because it was a too much in a bowl. Maybe it would have been different for a bigger crowd. I loved the flavors together but a little goes a long way because it does end up with an intense flavor. I made this tonight and it was wonderful! Thank you for posting such wonderful recipes! So happy you liked it Linda! I’m taking it to new years party tonight!! YUM we ate this last night ! What a clever idea! This is definitely on my ‘make soon’ list. This dip would be great with socca instead of pita chips for those of us who cannot eat gluten. I like David Lebovitz’s recipe. 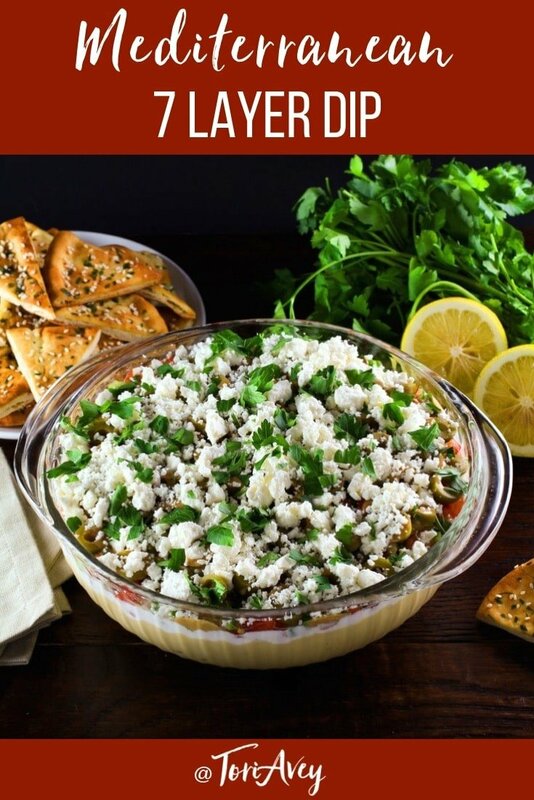 For anyone out there–like me–who gets sticker-shock from supermarket feta, middle eastern markets sell big white plastic boxes of Bulgarian feta for a fraction of the price, and it is delicious. They will also have a good price on pitted green olives. My local market is Afghan. Leta- yes! Also the Israeli block feta available in many Middle Eastern markets tends to be reasonable, and it’s some of the best I’ve ever had– so creamy! This sounds scrumptious – perfect timing for NYE celebrations! Thanks for reminding me, I need to make another fresh batch of hummus! Happy New year! Dear Tory, may you have a good 2014 – with good health and peace of mind. Thanks so much for your wonderful recipes – always quote you and have learned so much. I am going to try the 7 layer salad – sounds and looks fabulous. this does sound good – I will have to try it! Looks Good and Taste Great! Happy New Year 2014! another wonderful recipe as always! This sounds lovely! I’ll certainly make it for our next girls’ night. Thanks foe another yummy recipe for tuesday! May try it for New Years party! Connie you need to make this & let me know. I used to hate hummus but now I like it. Yum! This looks so delicious and easy to make. We are absolute fiends for Mediterranean food, so I cannot waitto try this recipe out. Thank you for sharing! This Recipe has been “stalking” me – everywhere I go, I see a link to it, and I want to have some sooooo bad!! Will be a bit of a scavenger hunt going hither and yon to pick up the ingredients because most of them are NOT in my immediate location, but there are several Middle Eastern oriented grocers in the big town next door. Yayy! 8 layers for me, I’m going to add toum. Everything you make looks so good! wonder how many ww points a serving is? What a brilliant idea! I’m definitely going to give it a try. Yummy….have to make along with my hummus. yep I bought dip stuff and chip stuff for the holiday! Kids love it! Awwww honey, of course we understand. I think I can speak freely for everyone who visits your site. As the year closes down, I’d like to take this opportunity to thank you, dear heart, for all you do & all the work you put forth in sharing your recipes & wisdom with the rest of us. 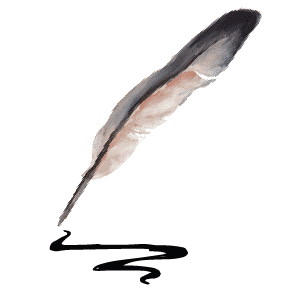 You are faithful to your work on this blog & elsewhere… and that fact is not lost on me nor many others. You are a sweetheart & may 2014 be a year of blessings for you & all those you love. Happy New Year Tori Avey (and I can’t wait to make this dip)!! You have one lucky family!!! Fabulous. 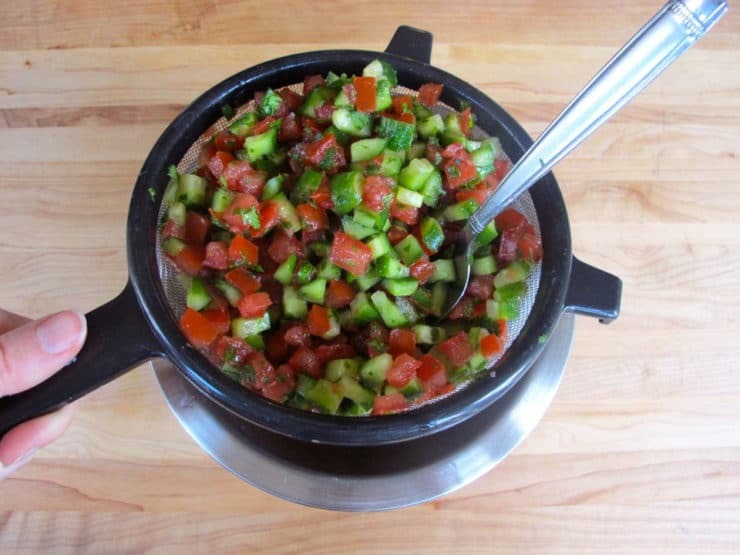 I don’t like most popular dips and appetizers, but this is marvelous. Yum! Looks and sounds amazing!! We eat a lot of 7 layer dip in Texas (too much probably) I love this lighter version!